Remember when going on vacation was relaxing and fun? All you had to worry about was boarding the plane and relaxing with a glass of wine as someone else took you to your destination, followed by casually unpacking a suitcase and deciding which pool or beach to visit based on the swim-up bar. Those were the days. 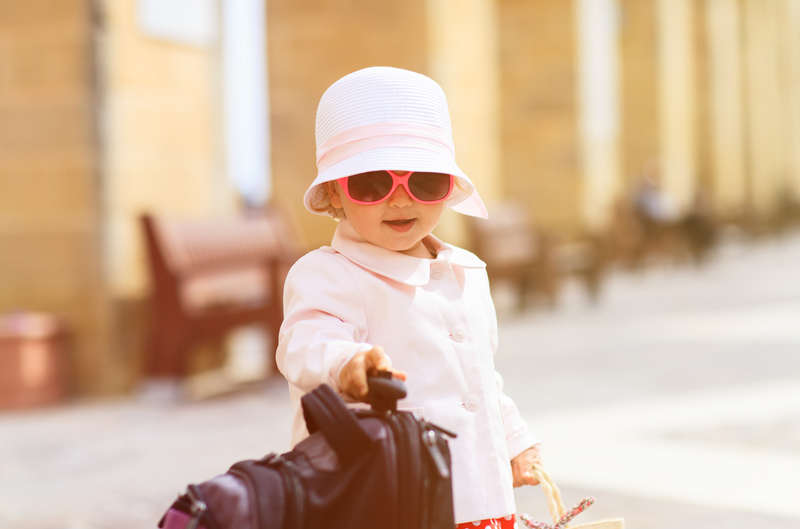 Now you’re traveling alone with a toddler, and even if you are heading on a relaxing vacation, the trip there can sometimes seem anything but. Even if your toddler is the perfect angel, the trip is likely to cause some stress. Some of it might be the pressure we put on ourselves to keep a squirmy toddler calm and quiet on an airplane or a train, or in the car. And some of the stress arises just thinking about the challenges that await. I traveled with my toddler(s) alone several times—too many to count. One time I was unexpectedly by myself on a nine-hour cross-Atlantic trip with two car seats, a double stroller, and eight bags. Thank goodness for the free Baileys. 1. Do not board the airplane early. I know it sounds like a good idea, especially if you’ve been chasing your little ones around the airport for the past hour, but when your flight welcomes families with young children aboard before everyone else, try to refrain. You do not want to be on the airplane longer than you have to with a small child. Trust me. 2. Remember car-seat safety. Kids are more comfortable in their own car seats. Although it sounds appealing to rent one along with your rental car or not have to bring your own car seat on the airplane to save some money and baggage, experts caution against that. “A rental car seat is usually not a good idea, because sometimes they’re worn, broken, or simply inappropriate. We’ve seen high chairs and restaurant boosters as ‘car seat’ options at car rental locations,” says Laurel Frock of the car seat education organization Car Seats for The Littles. 3. Include extra clothes as carry-ons—for everyone. You already have extra outfits packed for your little ones, but you really need one for you, too—and if you don’t bring an entire outfit, at least pack a shirt. Why? Because if your kids spill something or get sick, or a diaper explodes, you’re going to get dirty. And you’re going to want something to change into, especially if it is a long trip . . . or your luggage gets lost . . . or you get stranded. You get the idea. 4. Sticky notes are great for automatic flushing toilets. Traveling while your child is potty training is just about as rough as it can get. My friend Amy says just don’t do it, but we all know that isn’t always possible. Kids can get freaked out by those automatic flushers. Slap a sticky note over the sensor and then you have nothing to worry about, and bonus points if the kids get to pick out the sticky notes! 5. Pack your own food. Snacks are fun to have on any trip and usually are easy to pack. But I like to pack a meal even when we’re flying. Lunch boxes full of yogurt, apples, sandwiches, and Goldfish crackers are perfect for meals on the go—and it’s cheaper when you bring meals from home. Eating airport food, fast food, and at restaurants while you travel can get expensive fast, and kids can get picky at the most inconvenient moments. 6. Invest in a travel potty. These little potties are the best invention ever. I had them all over my house—in addition to one in the car—while my kids were potty training. Even when your kids are past the potty-training stage, these potties are awesome. They are super lightweight and easy to fit anywhere, and they prevent the anxious moments of wondering if you really will find a bathroom in southwest Arizona when your child needs one. 7. Check a local pregnancy center for loaner furniture. This was huge for me when I lived overseas. I came back for a visit and discovered my awesome plan to borrow what I needed wasn’t working. My mom suggested calling the local pregnancy center. Turns out these centers love lending things to people who need them, even if you aren’t coming in for counseling. I borrowed a swing and a car seat, and the center even had toys! One time when I was on vacation with my family, I rented a high chair and playpen from a local furniture store as well. 8. Children can feel your stress, so try to relax. Kids pick up on stress very quickly. They know when we are stressed out often before we realize it ourselves. The trip is going to have ups and downs, so try to accept them and choose your battles. Consistency is important, but nothing is going to be perfect, so don’t worry about those things. 9. Don’t excuse your children’s poor behavior because you’re traveling. When thinking about the things we do for our children, I quickly realized that much of what they come to expect from us has been taught to them by us. Think back to the road trips and vacations you took as a kid. Did your parents supply you with movies, snacks, and new toys? Probably not. They expected you to behave and entertain yourselves, and often made those few stops and overnights in a hotel enjoyable as a reward. Don’t set yourself up for 16 more years of high expectations. 10. Stay in a hotel with a pool; it’ll help wear them out! Hotel sleeping is hard for kids; it’s a new and unfamiliar environment, and they are sleeping with their siblings or in the same room as a parent. There are lots of new things to touch and explore. Head on down to the pool to let them get out some energy before a nice, relaxing bath and a quiet bedtime. Here is where routine comes into play. Whatever you do at home, try to do on the road as well. It will make everyone feel more comfortable and ideally will result in a quick bedtime—then you can relax. Hopefully, these tips will encourage you to have a relaxing and enjoyable trip. And remember, the toddler years last only so long, and one day you’ll have the privilege of traveling with a teenager!